Improved Import extension enhance the ability of default Magento import process with adding the most requested by Magento community import features! 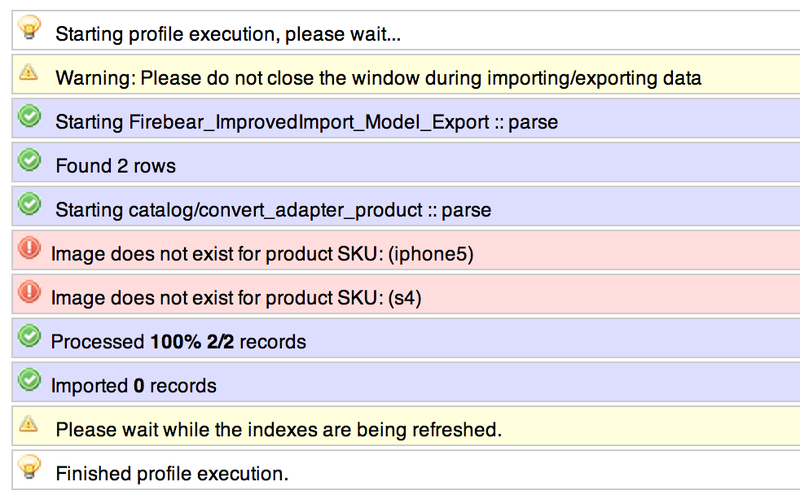 All this features works with default Magento Dataflow import/export from .csv files. We provide detaileda manual and .csv samples for make you life easy! This extension can be very helpful for product migration from another E-Commerce systems to Magento and also on data migration between Magento stores. Extension can be also used for update already exist products with multiple images, additional images from URL, custom options and tier prices! On this post you can find official manual for Improved Import extension – detailed instruction for use each feature, how create correct .csv file for import, description of extension settings and other tips about Magento import process. Please note – all extension features can be used in same time – this mean in one .csv you can add all columns for additional images, images from URL, tier prices, use images from URL as main product images etc. But please very carefully read all next instructions for make all correct! For install extension just unzip content of archive what you download after purchase to you Magento root folder with merge files. After this clean Magento cache on Magento Admin -> System -> Cache Management -> Flush Magento cache and last step is logout from Magento admin and login back! Enabled – Yes / No – Global Enable / Disable for Improved Import extension. Multiple Image Column Name – Text input – The header in your CSV where you will put your additional images from URL to import. When importing multiple images from URL, separate with a semi-colon, put full image URL: ‘http://site.com/image1.jpg;http://site.com/image2.jpg;http://site.com/image3.jpg’. Enable images from URL for main images – Allow images from URL for main product images (image, small_image, or thumbnail). Enable product custom options import – Enable import product custom options. To import a custom option you need to add a new column to your CSV import file. The name of the column determines the name and type of the option. Enable product tier prices import – Enable tier prices product import. You can add column to you .csv file with special prices for different customers group for each product. Enable customers import with unencrypted password – Enable customers import with unencrypted password – you just need specify column on you CSV and put there unencrypted password. 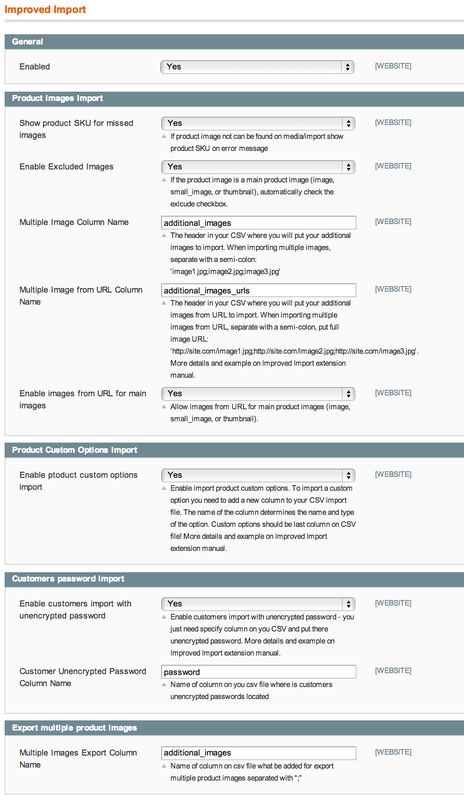 By default in Magento you can import only tree types of product images – image, small_image and thumbnail. This is sad, because usually each product on you store can have much more images, photos etc. With Improved Import you can import as many images as you want for each product! Additional product images by default be displayed as product gallery images on product view page. Import multiple products images feature can be very helpful together with Export multiple product images feature – use only Imroved Import extension you can easy migrate products with multiple images between Magento stores! Upload all you images to media/import (if not exist – create it! )folder on you Magento installation folder. Make sure media/import be writable, you can make this with CHMOD 777 on you server. On .csv file you must have tree default required columns for images import – image, small_image and thumbnail. On this columns you must put absolute patch from /media/import folder to image for each product. Example if you copy img1.jpg directly to media/import folder, on .csv file you should put just “/img1.jpg”. But if you copy image img1.jpg to media/import/some_folder – on .csv file image column you should put “/import/some_folder/img1.jpg”. Same patch rules works for multiple product images images import. Allow product images import from external URLs, this mean instead of copy product images to media/import folder for import you can just use external URLs from another sites or image storages on you csv file (like “http://sample.com/image.jpg”). External images can be used as main product images (image, small_image and thumbnail) and also you can add additional column to you .csv file for import multiple images from external URLs same as images what be uploaded to you server! Please note – import images from external URL can take much more time that usually images import because before import to Magento, Improved Import extension go to download each images from URLs for palce it on media folder on you server. 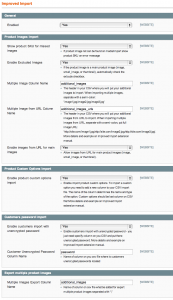 Magento not can processed import product if one of main product images – image, small_image, thumbnail be missed on media/import folder. When this happens you see error you import process – Image does not exist but you not can know for what exactly product image missed. Show SKU for missed images feature of Improved Import extension allow you to see for what exactly product SKU image missed. This feature works or default Magento product images import and for multiple product images import with Improved import extension. By default in Magento you can import only product attributes but not product custom options, this is can be very big problem add custom options manual in admin for each product. With improved import you can add column on you csv file for import and create product custom options with parameters like option name, type, values etc. This is very easy and flexible method for mass product custom options import and creation. 3. Now let’s have look how you need fill custom options values on you .csv rows. For custom option types with multiple values (drop_down, radio, checkbox, multiple) you need specify using a | separator. Example with Memory custom option: 8GB, 16GB, 32GB you must use “8GB|16GB|32GB” as values for “Memory:drop_down:1” column in your .csv file. 5. Now you can fill custom option values for each product on specific option column. This feature allow you import different product prices for different customers groups on you Magento store. Just add new column on you csv for each customer group. Also you can setup minimum products qty what must be purchased for get special group price. Tier prices works with customers groups in Magento what can be found on Magento admin -> Customers -> Customer group here you can manage customer groups and create new. You must add new column to you .csv in the form “price_groupname” or “price_groupname_minqty” where is groupname – customer group name according to group name on Magento admin but in lowercase! (this mean if you have group Special it must be “special”, “Wholesale” as “wholesale” etc. also group name cannot contain underscores ) qty – it’s minimum qty from what special price start. Magento use one side encryption for save customers passwords, this mean you need use hashed passwords in customers import progress, it’s not problem when you import customers from another Magento store but if you have you customers passwords without hashing you not have possibility to import it in Magento. This feature resolve this problem, now you can just put unhashed customer passwords on special csv column on import progress. For import customers with unhashed passwords you need enable this options on extnesion settings page Customer password import -> Enable customers import with unencrypted password. Also here you can change column name what be used in you .csv for unencrypted customer passwords (by default – password). Please note – if you disable this feature, you can import customer with default Magento settings, this mean on you .csv you must have column with hashed customers passwords (it’s possible only if you make impiort from another Magento store) or Magento can just genarte new password for each customer. On you .csv with customers data you need add new column according to unencrypted customer passwords (by default – password) and fill it for each customer. Impoved Import extension allow you not only import but also export multiple product images, this mean on export process you get all product images what you have on you Magento admin. This feature can be very helpful with migration products with multiple images between Magento stores – exported column on .csv file can be used on multiple images import without any modifications, you just need place images on media/import folder. 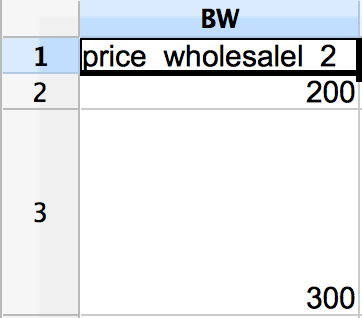 In result you get .csv with all product images in additional column. Few products in .csv file assume you have category with id = 3, you can change category for sample import on category_ids column. Error on import process Warning: include(NOTICE.php): failed to open stream: No such file or directory in magento/lib/Varien/Autoload.php on line 93 – something wrong with column names on you .csv file, check column names for multiple images, ier prices etc. All should be correct according to samples. If you not want import tier prices but want import product custom options – please disable tier prices import in extension settings, here is can be some conflicts if tier prices import enabled but column with data not exist in csv. Can’t get image from URL for product SKU: (here is you product SKU) – here is error from server side – URL file-access is disabled in the server configuration – this come from PHP configuration by you hosting provider, here is link with details about this http://www.solo-technology.com/blog/2010/04/07/quick-fix-for-url-file-access-is-disabled-issues/ , also you can find details about this error in var/system.log in you Magento installation. Also it’s can be issue with folder permissions, make sure you have 777 for media/import folder. If you have any questions, troubles or suggestions please feel free ask on comments or contact us. More import/export improvements coming with each next release of extension!